Midnight blue water rested at the horizon under a brightening sky, framing shafts of pine and fir at shore’s edge. It was a July dawn in 1995, and I was visiting Lopez Island, off the coast of Seattle, birdwatching. Bald eagle chicks had just fledged in this yard, and they couldn’t be far away now. I turned toward the tops of the pines, eager to spot that huge platform of sticks, three to five feet across. Surely a nest the size of a mattress should be easy to find! I scanned the tips of all the trees in one direction, then the other. No nest. I climbed over rocks to the water’s edge, gazing across the deep dawn-blue of the sea. No eagles. I wondered how to find them. The thought occurred: Why don’t you call them? While meditating recently, I’d seen trees and birds in my mind’s eye, but that was meditation, not “real” life. Summoning a bird or animal with the mind is the stuff of sci fi and fantasy; we all know it doesn’t actually work. Still, I was going to be here only until tomorrow, and if I wanted to see bald eagles, there was no time to waste. I sat down on a bed of pine needles, closed my eyes, and took a deep breath. Inside, thoughts ran wild: This is silly . . . They’ll never show up . . . Now you’ve gone off the deep end. I took another deep breath and brought to mind a picture of a bald eagle: that white head, those fierce yellow eyes and hooked beak; the dark body, white tail, and powerful talons that could make off with a fish nearly half the bird’s size. Once I had a clear image of a bald eagle, I tried to still my churning thoughts. I collected all my yearning to see a bald eagle. Please, I spoke mentally to the image, I’d really like to see you. Is it possible for you to hear me? Behind my yearning I could hear another voice: Yeah, sure, right—now you’re praying to birds? Talking silently to a being you can’t see, who may not even be there? I breathed again and refocused. I’m only going to be here until tomorrow, and I’ve never seen you. I would like to glimpse your powerful wings. There was no more to do. I opened my eyes. The sun was far above the horizon now, the air warm. It was midmorning. I sat in the sunshine and gazed quietly at the surrounding pines. How long do you wait for an eagle to come when you call? If you’re impatient like me, not very long. A minute ticked by, then two, then ten. Nothing happened. Trying not to notice a corner of disappointment, I stood up and headed toward the bike shop across the way. My chances of seeing eagles would increase—wouldn’t they?—if I covered the island. Map in hand, new Lopez Island visor peeking out from under my bike helmet, I headed out. Soon I was engulfed by peaceful summer fields stretching to the horizon, the sea no longer visible beyond gold and green undulations. Throughout the day I scanned the horizon for black wings spread wider than a hawk’s and sweeping out from the body, not lifted in a V like a vulture’s. I saw wetlands and rock cliffs and pine trees silhouetted black against the blue sound, but no eagles’ wings. Up early again the next morning, I took one last hike around the house. If the nest was so obvious, why couldn’t I spot it? I called again to the eagles. And please, I added, hoping I didn’t sound too demanding, it has to be soon, because I have to leave right now. I returned the bike to the shop then began hiking up the road toward the ferry landing, feeling disappointed. The meditation hadn’t “worked.” But really, what did I expect? Less than a mile into my hike, I heard a car approaching and stuck out my thumb. The small convertible pulled to a stop beside me, and the woman driving cheerfully waved me in. I hefted my pack over the side and settled in gratefully. Sun warmed the backs of our necks as we made our way north. We were now in the very middle of the island. No other cars passed us on the road, there were no trees nearby, and we were sailing past tranquil fields, our vision open to the sky. I looked over to the right and saw, far away, across the fields, above the tree line at the eastern horizon, a tiny black spot in the sky. I ripped my binoculars from my pack and focused. Those spread-wide wings! Closer it drew. A nearly invisible tail! A light-colored head! Over here! I called silently, involuntarily. A head and tail of white materialized in my lenses. The bald eagle was headed straight toward us. “Could you stop for a minute?” I asked the driver. She too had spotted the faraway shape to our right. “Sure,” she said, smiling, as she braked in the middle of the road and turned off the engine. Still the eagle approached, on a course that would take it directly over our heads. What happened next made my heart stop. 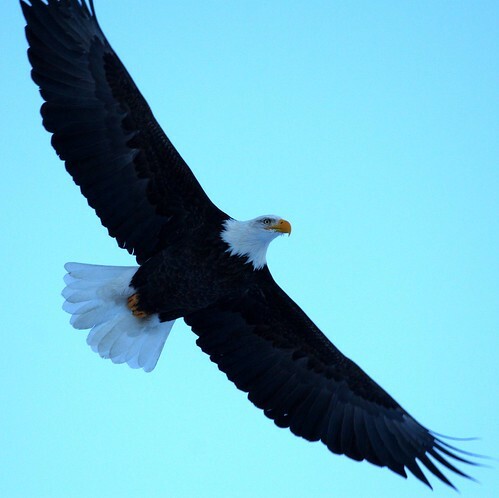 As we watched, the bald eagle, instead of flying over us and across the island, spotted the car below and, when it had arrived directly overhead, turned sharply to make a tight circle. I raised the binoculars again, eager for a closer look. There were the broad dark wings, spread white tail, pure white head. There were the sharp eyes trained on us as the eagle turned in orbit, shifting its regal head to stare directly down into the car. I watched, first with the glasses, then without. I had plenty of time to take in every detail, for the eagle, instead of making only one circle, was turning in many tight circles directly overhead. Thank you! I whispered silently. Thank you, oh, thank you! My heart was rising in my chest, as if elation could lift it to the eagle’s height. I watched until I couldn’t hold my head up anymore. Only then did the eagle break orbit, beat its wings twice, and head back toward the spot on the horizon from which it had appeared. Update: This story opens my book, Kissed by a Fox: And Other Stories of Friendship in Nature, published by Counterpoint in 2012. More about the book at kissedbyafox.com. And the energy that we put out to the universe becomes one, delivering to us that which we call. In other words: what we put “out there” comes back to us in so many ways. Your bald eagle is living proof. This brings back memories of my childhood summers on Orcas Island. I always felt so thrilled to see eagles and their nests there. By the way, I see you teach at Prescott College. My son, Amalesh, is a very happy student in the resident BA program there, and I’m a new graduate advisor in MAP. Perhaps I’ll meet you on one of my visits there.